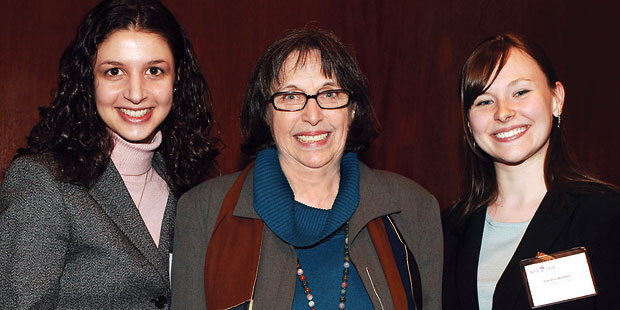 Law Women honored Professor Eleanor Fox ’61 with its first Alumna of the Year Award at their Alumnae Reception last March, in recognition of the many ways in which she has led the way for female attorneys. In a warm and well-received speech, Fox, the Walter J. Derenberg Professor of Trade Regulation, who teaches Antitrust Law, International and Comparative Competition Policy, European Union Law and Torts, briefly sketched her long and distinguished career. She recalled that when she went to work for the U.S. attorney’s office in the 1960s, it was believed that women shouldn’t “get their hands dirty,” so she was placed in the civil division, not the criminal one. Fox followed her philosophy of doing her best possible work no matter the circumstances, however, and that led her to become the first female partner at a major Wall Street firm, Simpson Thacher & Bartlett. “It never was suspected I would be a partner,” said Fox, by way of explaining how she eventually became one: through quiet, unassuming diligence. As Elise Roecker ’07, cochair of Law Women, observed in her introductory remarks, Fox’s impact has been far-reaching. “It is safe to say she has broken open antitrust law,” said Roecker, noting that Fox has advised two presidents, Clinton and Carter (for the latter, she served as commissioner of the National Commission for the Review of Antitrust Laws and Procedures); several countries including South Africa, Indonesia and Russia; and the European Union. In her speech, Fox emphasized the importance of finding mentors, naming several inspirational female faculty members in the audience, including Sylvia Law ’68 and Linda Silberman. But mentors can be men, too. “I had the good fortune of having a person or two blaze a path for me,” she said, adding that former dean Norman Redlich (LL.M. ’55) had appointed Fox an associate dean in charge of the J.D. division from 1987 to 1990; to date, Fox is the only woman to have held that position. Breaking barriers has been a way of life for Fox. Among her many posts, she has served as the first female chair of both the New York State Bar Antitrust Law Section and the Section on Antitrust and Economic Regulation of the Association of American Law Schools, and as the first female vice chair of the ABA Antitrust Section. Fox has made “extraordinary contributions to the legal world,” said Roecker, and it is important “to pay tribute to her humanity in an all-too-often cold profession.” That humanity is something Fox relishes. In addition to her books on antitrust and European Union law, mergers and central European competition policy, she has written a comic novel, W.L., Esquire (Marando Press, 1977), about women in the maledominated legal profession. Fox clears time in her busy schedule to have lunch with her 1Ls, and goes above and beyond to keep her students engaged in the classroom. Every year she recites a poem she wrote about Benjamin Cardozo’s opinion in Palsgraf v. Long Island Railroad Co. and proximate cause. Said Roecker: “I can tell you my class, at least, applauded.” The assembled guests responded to Fox the same way.